In this step you create an Amazon RDS MySQL DB instance that maintains the data used by a web application. Before you begin this step, you must have a VPC with both public and private subnets, and corresponding security groups. If you don't have these, see Tutorial: Create an Amazon VPC for Use with an Amazon RDS DB Instance. Complete the steps in Create a VPC with Private and Public Subnets, Create Additional Subnets, Create a VPC Security Group for a Public Web Server, and Create a VPC Security Group for a Private Amazon RDS DB Instance. In the top-right corner of the AWS Management Console, choose the AWS Region in which you want to create the DB instance. This example uses the US West (Oregon) region. On the Select engine page, shown following, choose MySQL, and then choose Next. On the Choose use case page, choose Dev/Test – MySQL, and then choose Next. License model: Use the default value. DB engine version: Use the default value. Master password: Choose a password. The VPC must have subnets in different Availability Zones. VPC security groups: Choose an existing VPC security group that is configured for private access, such as the tutorial-db-securitygroup created in Create a VPC Security Group for a Private Amazon RDS DB Instance. Remove other security groups, such as the default security group, by choosing the X associated with each. Leave the default settings for the other options. 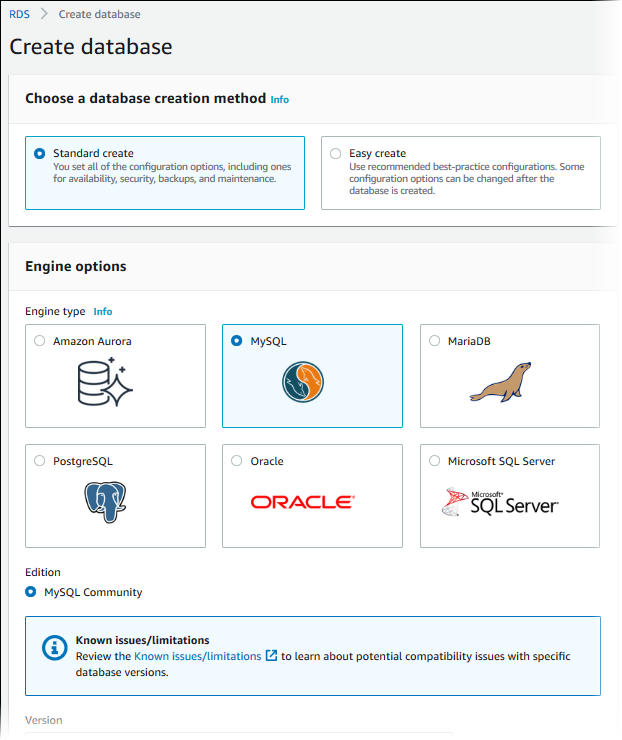 To create your Amazon RDS MySQL DB instance, choose Create database. On the next page, choose View DB instances details to view your RDS MySQL DB instance. Wait for the DB instance status of your new DB instance to show as available. Then scroll to the Connect section, shown following. Make note of the endpoint and port for your DB instance. You will use this information to connect your web server to your RDS DB instance. To make sure your RDS MySQL DB instance is as secure as possible, verify that sources outside of the VPC cannot connect to your RDS MySQL DB instance.